The DKnight MagicBox II bluetooth speakers offers great qulity sound with the latest Bluetooth 4.0 technology. It is easy to carry with, Weight only 11.5 ounces. Built in 2000 mAh rechargeable lasts up to 10 hours. Same Size (6 x 2 x 1.6 inches) with the original MagicBox, but implemented with 10W total acoustic drivers and enhanced passive radiator. It could provide 30% louder volume and richer Bass the original MagicBox without distortion even at highest volume. Built-in HD microphone and new echo-cancellation chipset, it is convenient for hand-free speaker phone calling, video chat, Google Talk, Skype or FaceTime. All devices with Bluetooth enabled. Any other devices with 3.5mm audio jack. Implemented with 10W total acoustic drivers and ultra-small size produce a wide audio spectrum. The newly designed passive radiator could provide strong bass without distortion even at highest volume. 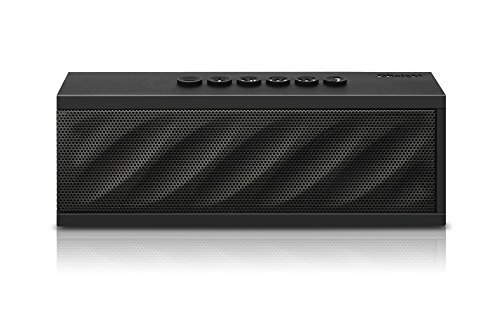 Equipped with the advanced Bluetooth 4.0 technology, compatible with all Bluetooth-enabled devices (Bluetooth V2.1 and over). Same Size (6 x 2 x 1.6 inches) with the original MagicBox, but implemented with 10W total acoustic drivers and enhanced passive radiator. It could provide 30% louder volume and richer Bass than the original MagicBox. Easily to carry with, only 11.5 ounces.Plays all Audio devices through 3.5mm Aux in Jack. 4.0, backward compatible with all standards.